Instead of being a victim of low Canadian oil prices, Suncor Energy takes full advantage of the situation with its integrated business model. Every part of the oil and gas business has its strengths and weaknesses. For Canadian oil sands producers, they benefit from oil sands being a long-life oil source that doesn't need a lot of money to maintain production for decades. The downside is that Canadian crude oil is dirt cheap, so margins aren't as attractive. 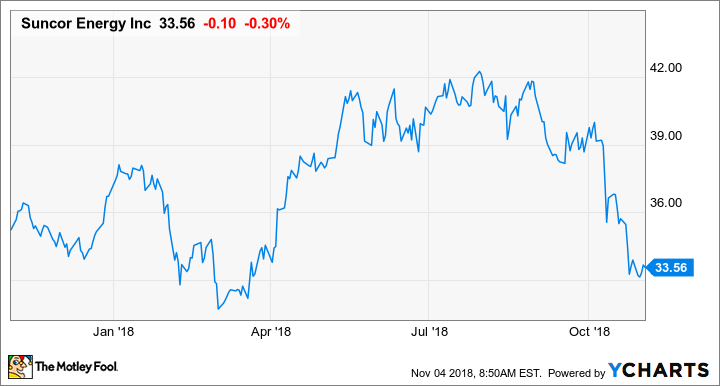 That isn't the case for Canadian oil giant Suncor Energy (NYSE:SU), though, as its business model is geared to both insulate the company from cheap Canadian crude prices as well as exploit the situation for higher profits. The best way to see how this works is to go through Suncor's earnings results. So here is a brief overview of how Suncor turns the idea of cheap Canadian crude on its head and why investors concerns should be focused on something else. DATA SOURCE: SUNCOR ENERGY EARNINGS RELEASE. EPS = EARNINGS PER SHARE. 1 CAD= 0.76 USD. It's not surprising that an oil company is doing well these days as oil prices, in general, are rather high. What is surprising is that a Canadian oil company is doing well these days because Canadian oil prices are severely depressed compared to other crudes. Each barrel of Western Canadian Select currently trades for $40, that's a little more than half the current price for the international benchmark oil price, Brent. The reason Suncor is able to churn out decent results even though Canadian oil prices are so low is thanks to two things: (1) a highly integrated business model, and (2) access to foreign markets. Unlike most companies that have a collection of upstream and downstream assets, Suncor's business focuses on the value chain for each oil molecule it produces. A large percentage of its refining operations is designed to handle heavy Canadian crude, so it can process its own product into higher-value gasoline and diesel instead of selling highly discounted bitumen or heavy sour crude. Then, there is market access, which is equally important. One-hundred percent of the crude oil it gets from its exploration and production segment is priced based on Brent, and another 10% of its oil sands is shipped to global markets instead of trying to move it all to the U.S. where there are clear transportation bottlenecks and steep discounts. Combined, these things resulted in Suncor realizing favorable oil prices while also reporting incredibly lucrative refining margins that boosted downstream results. Data source: Suncor Energy. Chart by author. Adding to the list of operational issues at Syncrude over the past couple of years, Suncor said that there was a power outage the facility that shut down operations late in the second quarter that continued into the third quarter. Management says the facility is back to running at normal operating rates. With Fort Hills and Hebron now operational, capital expenditures continue to decline and mostly represent capital to sustain the business. With the good results and declining capex, the company generated loads of free cash flow that it used to pay down debt and buy back shares. In Suncor's press release, CEO Steve Williams highlighted the company's ability to get favorable oil pricing through its refining and market access and how it used all of the free cash flow it generated as a result of this unique business model. Our downstream integration and favourable market access position continue to significantly mitigate the impact of wider crude differentials at Oil Sands. This helped generate significant discretionary free funds flow, which we returned to investors through close to [CA]$900 million in share repurchases while also reducing our debt by [CA]$1.2 billion. Williams also gave an update on Fort Hills and how one of management's priorities is to maintain that high level of integration and market access so it continues to get favorable pricing. The ramp up at Fort Hills has gone exceedingly well and the asset is now operating at target rates. As Fort Hills reaches sustained target production rates, it is important to note that we have sufficient pipeline access to move all of our Fort Hills barrels to markets in Canada and the U.S. that extend down to the Gulf Coast, where we are able to obtain maximum value for our product. Most investors will look at the transportation bottlenecks for Canadian oil and say that it's time to sell Canadian oil producers. Suncor isn't just a producer, though, and that integrated business model is why it is doing so well today. Instead of being a victim of low Canadian crude prices, it can exploit those cheap prices with its refining assets to generate outsized profits. For investors in Suncor, their concerns shouldn't be on cheap Canadian crude, they should be more concerned that the company is continuing to struggle to operate Syncrude and its partners seeming lack of interest from its partners to fix these issues right away. Syncrude represents a significant portion of the company's overall production and having constantly down for various operational issues will be a drag on profitability. The other thing to be concerned about is the incredibly dry project pipeline. Management has been extremely hesitant to sanction new oil sands projects due to the lack of new pipelines. As a result, the only expansion capital it has deployed lately is for continued development at its existing offshore fields and to boost production at some existing oil sands facilities. So it looks like we might not see much production growth over the next decade once Fort Hills and Hebron are at capacity. The good news is that Suncor doesn't necessarily need to grow production to create value for shareholders. Oil sands production doesn't decline like a conventional well and can continue for decades with minimal capital spending. So Suncor can generate shareholder value by taking its loads of free cash and giving it back to shareholders through buybacks and dividends. It isn't the sexiest way to boost shareholder value, but it is probably the most effective way for Suncor's business.